Our next day started around 7.30 in the morning. 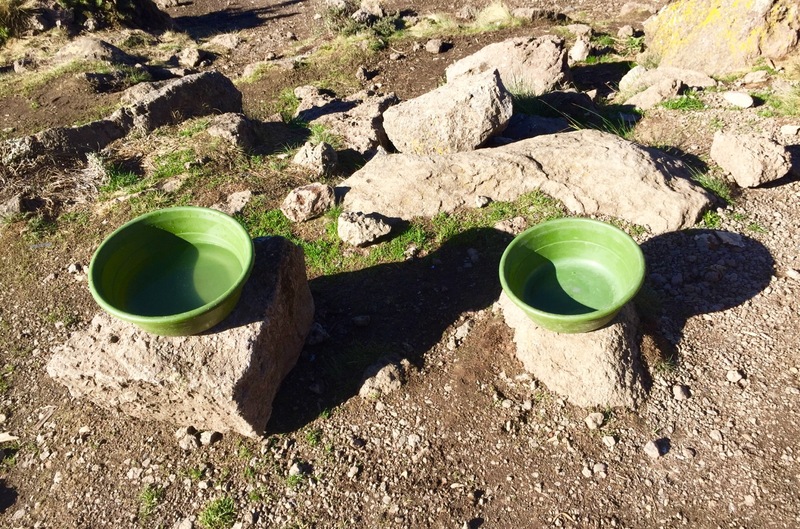 Timo and I were each given a bowl of hot water, which the porters placed in front of our tent. You can use it for brushing your teeth (for that purpose, however, you can just as well take water from your drinking bottle) and basic personal hygiene. finally, no one notices as everyone is in the same boat and got used to it by then! The morning mood up the mountain is refreshing and emanates something positive. It made our breakfasts, which we usually had outside, even nicer. 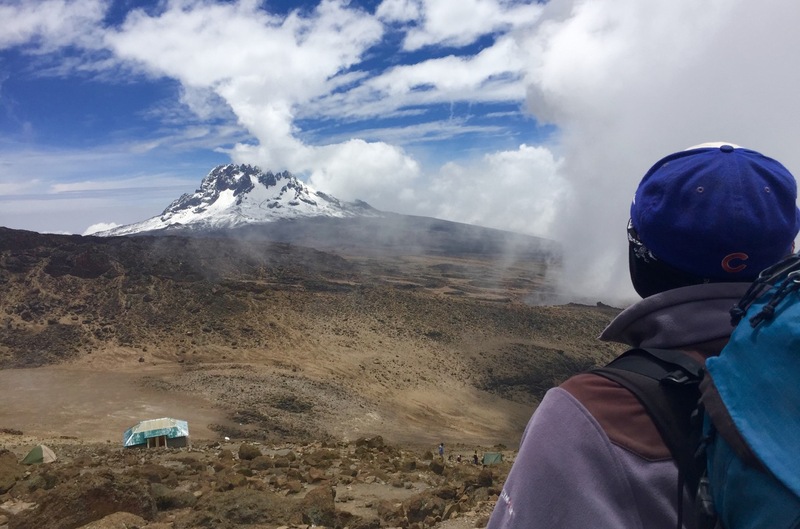 Once more, we saw the snow-covered summit of Kibo – a breathtaking view. 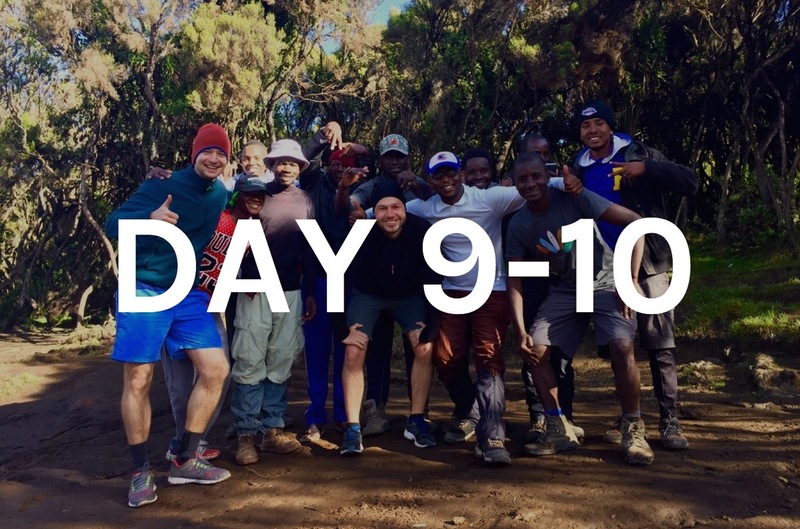 Around 8.30 a.m. we left Machame Camp and started our hike towards Shira Camp. At this point we present you a classical daily routine. 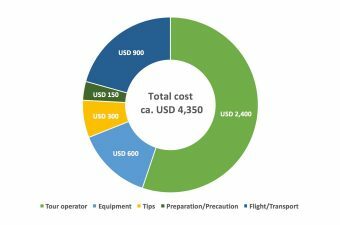 Thus, you get a better impression of the activities and routines of the trip. 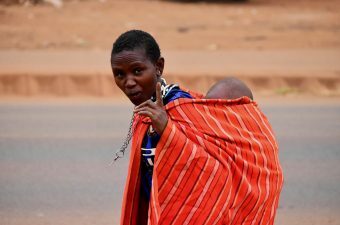 Who walks when, with whom, and what does a normal hiking day look like? Days usually start around 7.30 in the morning – getting up and dressed for the day, packing everything, breakfast around 8.00 a.m. and leaving between 8.30 – 9.00 a.m. Every morning, we were given hot water for brushing teeth and having a wash. For breakfast, we frequently had something else, usually a mix of toast, porridge, pancakes, egg, sausages, bacon, butter, jam, and different types of fruits such as mangos and oranges. Tea, coffee, water, and fruit juices were offered to us for drinks. We had breakfast outside at a table in front of our tent each morning. Afterwards, we started the hike for the day. It is also recommendable to take aspirin (in low doses) and vitamins with you, which you can take from time to time during the hike. We also had Ibuprophen on us, however, rarely made use of it. 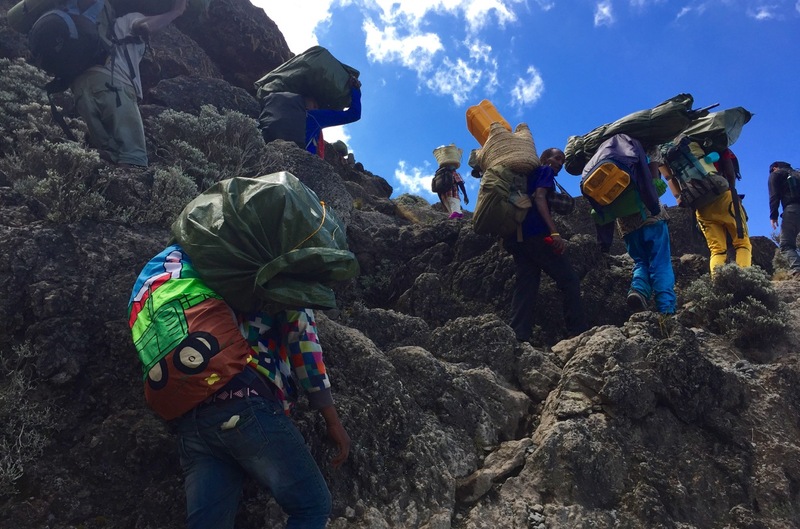 Travelling light during the hike is another success factor for reaching the top of the mountain. Thus, you should try to carry no more than 6-7 kg in your daypack during the hikes from camp to camp. Usually, this is plenty. 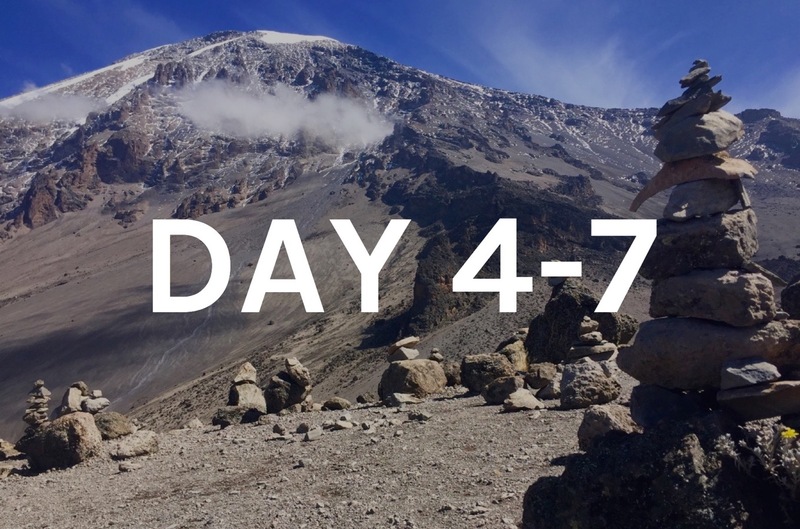 Here you find an overview of topics that will help you with your preparation for climbing Mount Kilimanjaro. All the things we did not need during the hike between the camps we left in the previously addressed waterproof bags, which were then carried by our porters. 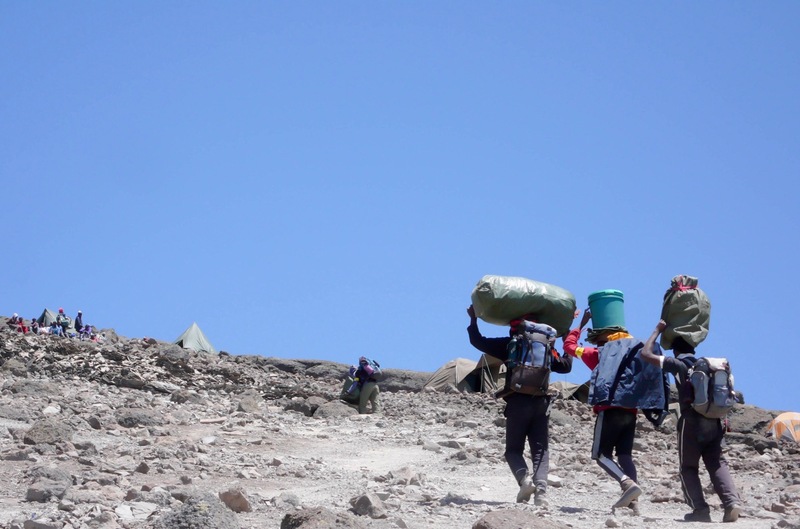 The porters and our cook overtook us regularly during the hikes. Thus, upon arrival in the next camp, everything was set-up for us. The waterproof bags with our personal belongings were placed in our tent. We recommend putting your luggage in additional small pouches. Doing so better protects them from dust and weather conditions. Moreover, we felt it was more hygienic as the waterproof bags are reused. 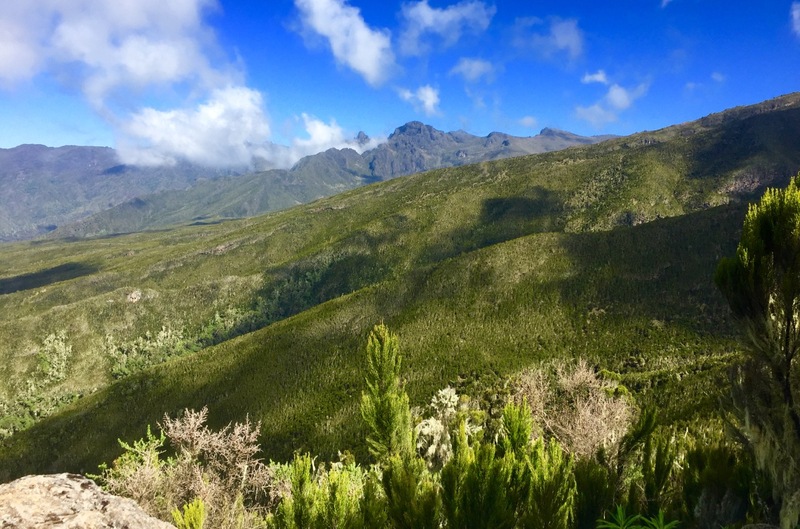 The hikes from camp to camp are diverse with regards to flora, fauna and terrain. 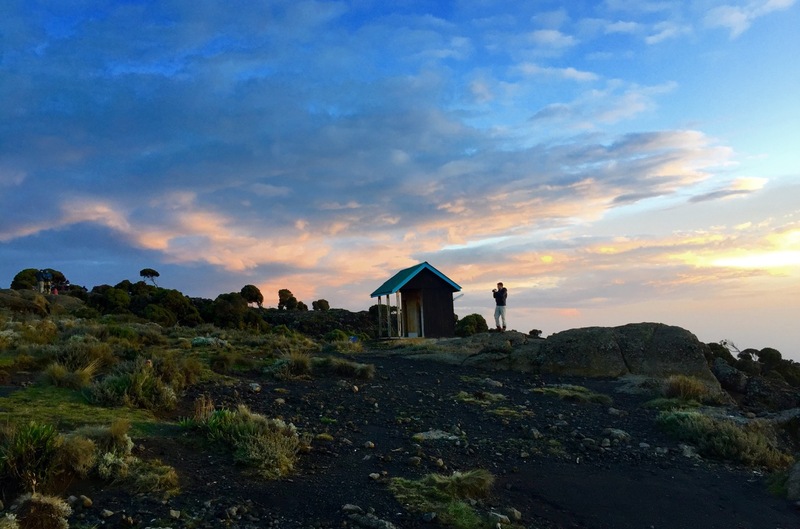 Machame Route is esteemed to be one of the most beautiful routes. 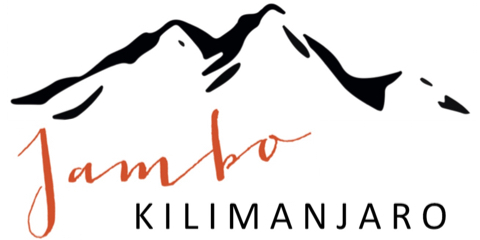 However, it is also seen as slightly more demanding than other tracks up the top of Kibo (hence, the name “Whiskey Route”). 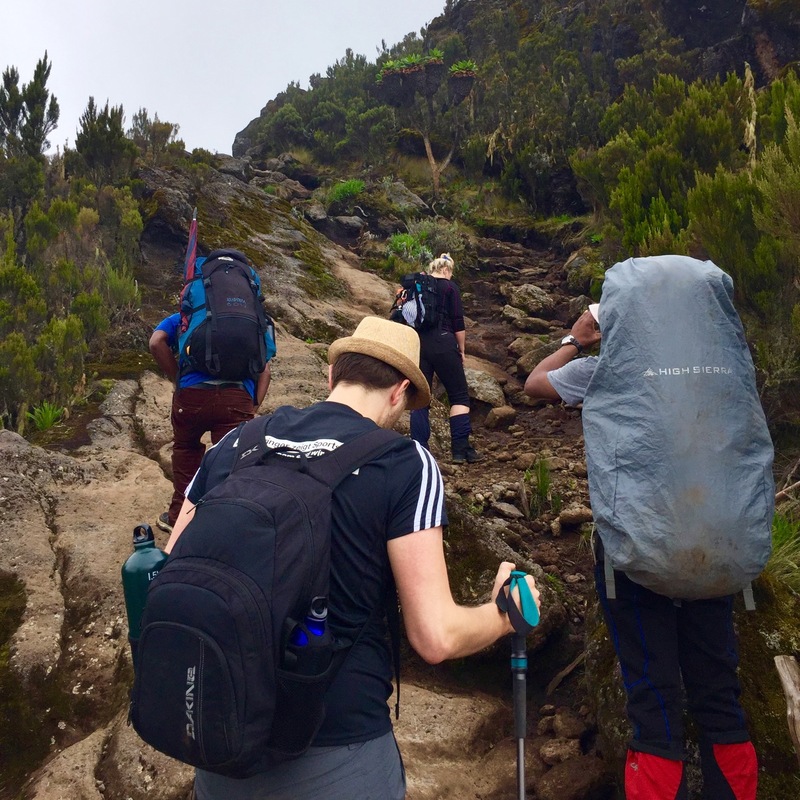 All in all, climbing Mount Kilimanjaro is a trekking tour and has only little to do with alpine hiking or even climbing. It’s for that reason, that people of all ages climb the summit. In any case, a basic fitness-level and certain mental strength are helpful, no matter which route you choose. Overall, we were walking relatively slowly, however, which is normal. 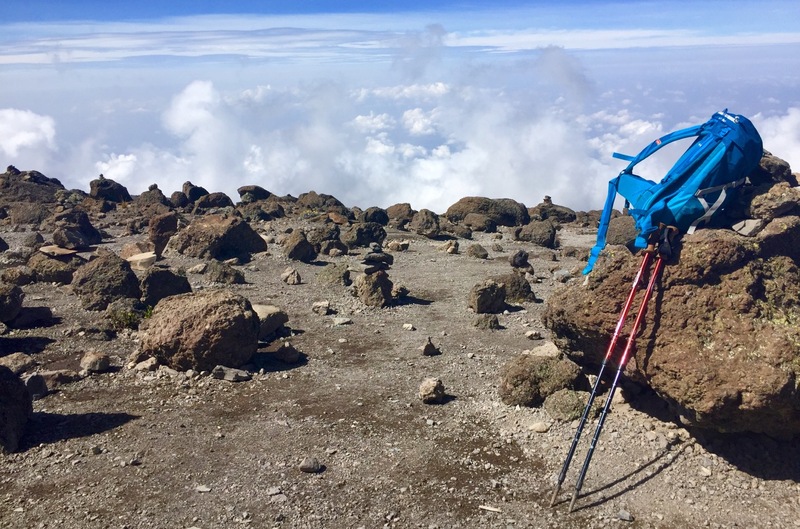 Especially upon first arrival at 4,000 meters (around 13,100 ft) and during hikes at higher altitudes for acclimatization purposes you consciously put one foot in front of the other – “pole pole”, slowly slowly. Moreover, we paused frequently to rest, drink and have some snacks. We carried our lunch in respective lunch boxes. Especially during the afternoon and at lower altitudes rainfall is quite common. Hence, we strongly recommend carrying waterproof or at least water-repellent clothing with you such as rain capes or an umbrella (sounds funny, however, we can confirm it’s really useful!). 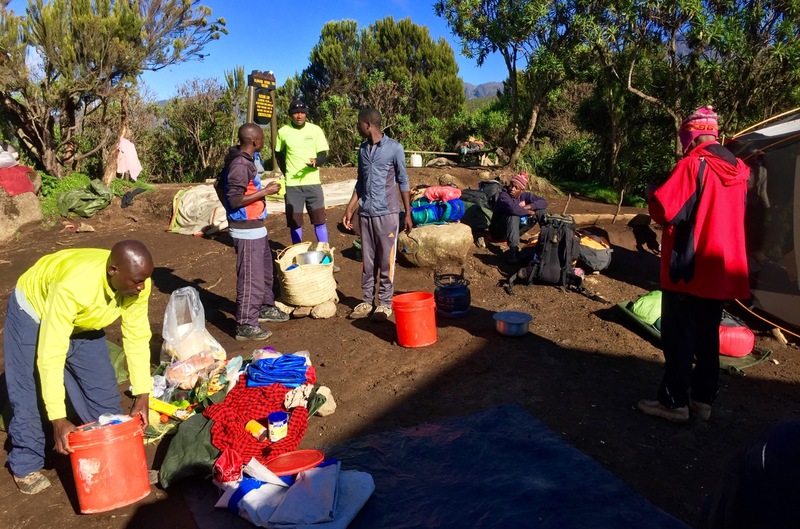 Here you find a complete equipment and packing list for climbing Mount Kilimanjaro. In the late afternoon, we reached the next camp. 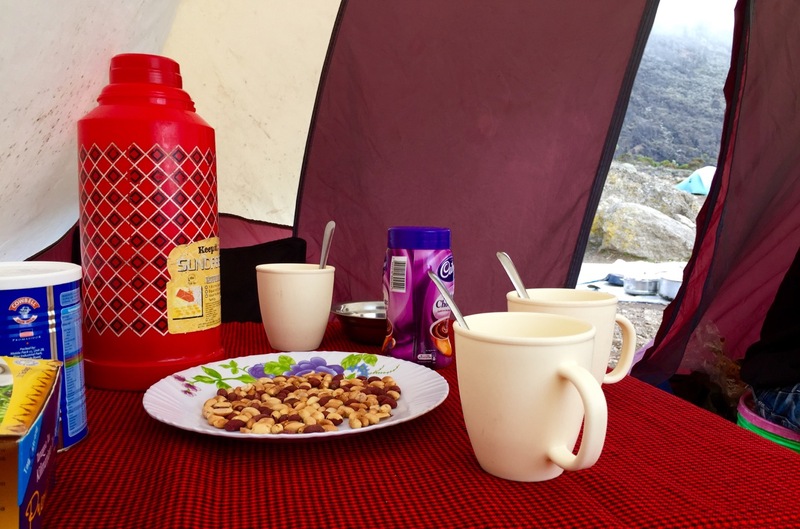 Once arrived, we unpacked, relaxed and enjoyed the afternoon snack, which usually included popcorn or peanuts and a hot drink. 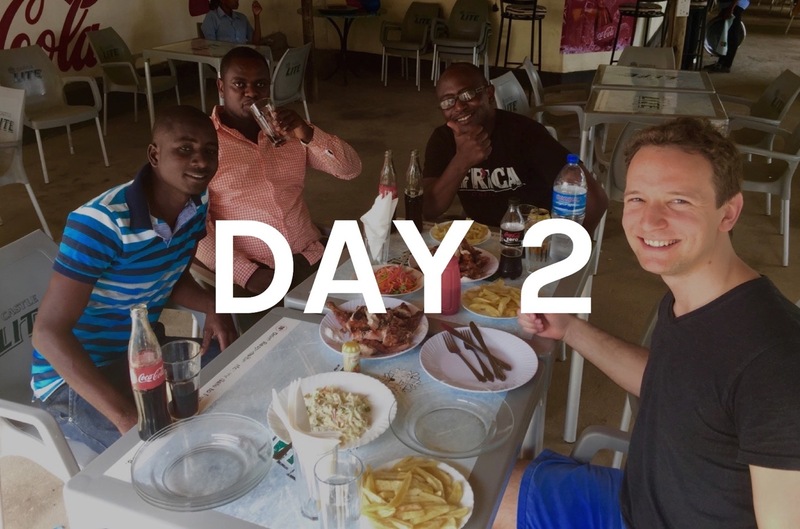 We used the time in the camps until dinner to chat with other travelers or to discover the area. Card as well as board games can also be a nice pastime. We had dinner around 7 p.m., and usually ate together with Erasto or Amos. 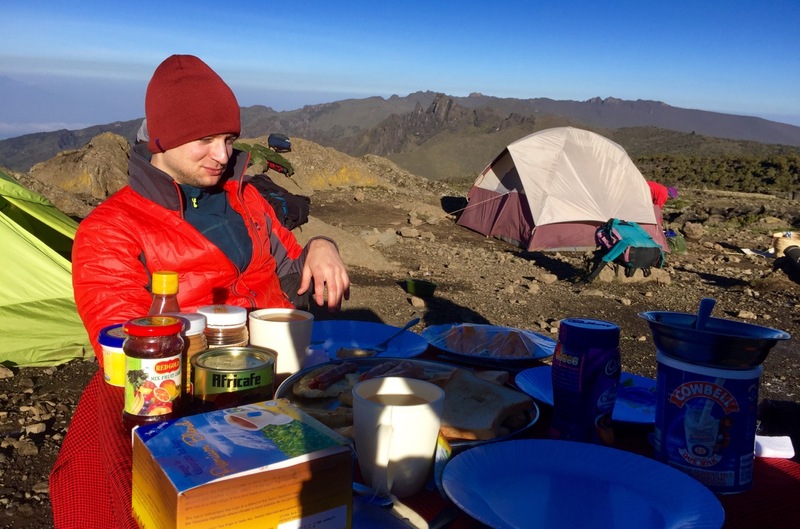 During dinner time, it is already dark outside, and at altitudes of around 4,000 meters considerably colder at night. We therefore ate inside a larger tent. The mood was always good and convivial. 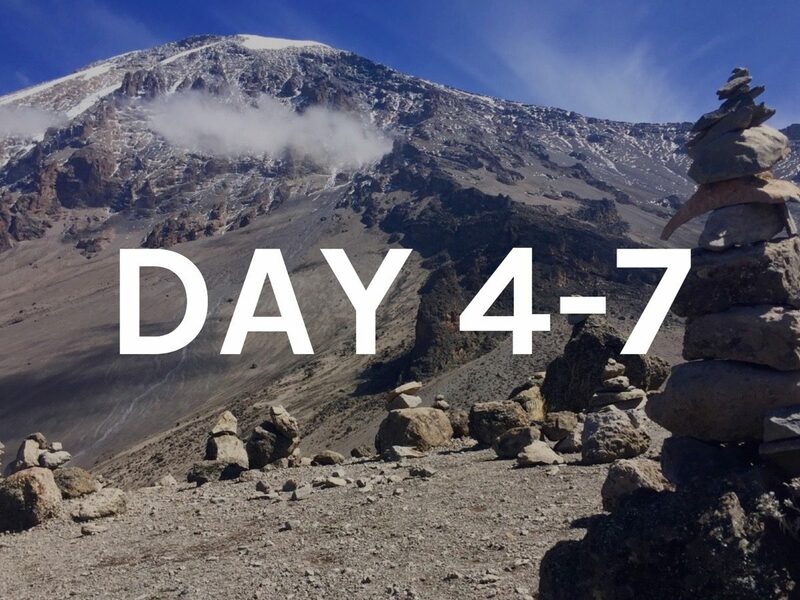 We learned a lot about the Kilimanjaro as well as about the country and its people. After dinner, we had our regular briefing: What the next day would look like in terms of altitude, walking distance, and “dress code” for the night. 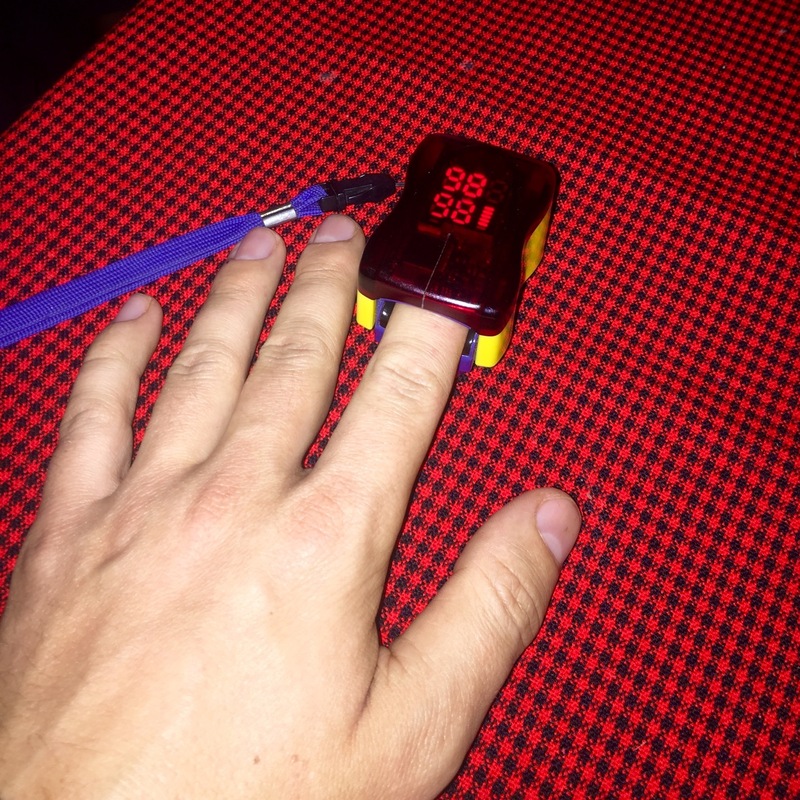 Moreover, Erasto measured our heartbeat and the oxygen saturation in our blood by putting a simple clip (pulse oximeter) on our index finger. From the third day onwards, water is taken directly from streams on the mountain. Even though water is boiled before drinking, Timo and I still added tablets to sterilize the water. They can slightly change the taste of the water, however, make it more digestible. We thus recommend adding such tablets to spring water. We handed them to Erasto in the evening so that the next morning we would have fresh water. Like most other days, we went into our tent at the latest around 9 p.m. The first part of the hike between these two camps leads through a wooded area. Trees are no longer growing high, however, and the forest is thinner than before. We reached the 3,000-meter mark (about 9,800 ft) relatively quickly. From that moment on we frequently had impressive views. Through uprising fog patches, we walked further up the mountain and arrived at 3,750 m high Shira Camp just before rainfall started. The camp lies on the border of the moorland. Only a few meters higher the stone desert begins. For an overview over the different vegetation zones best check here. 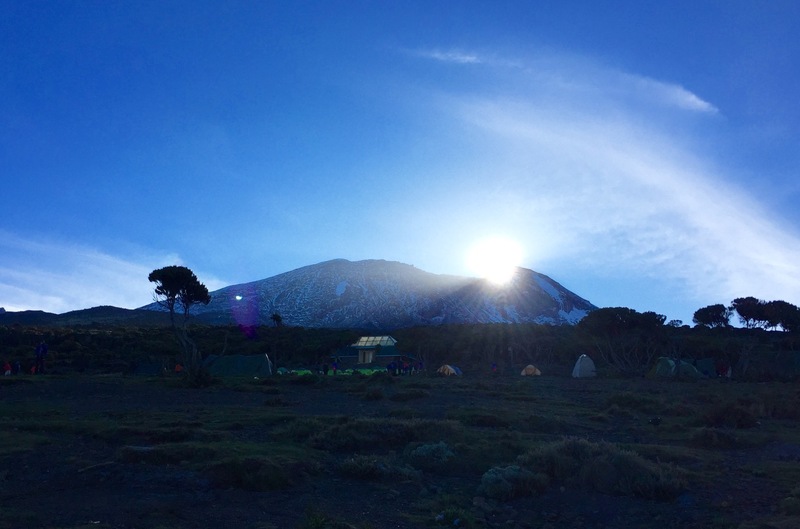 From Shira Camp, we had impressive views on both Kibo and Shira, the highest and the lowest of the three volcanic cones of Mount Kilimanjaro, respectively. The view up the mountain was also fascinating especially due to the changing illumination. Shortly after leaving Shira Camp we arrived in the stone desert, the last vegetation zone before the eternal ice (but: attention, it is melting!). The way up the mountain is less steep than the day before. 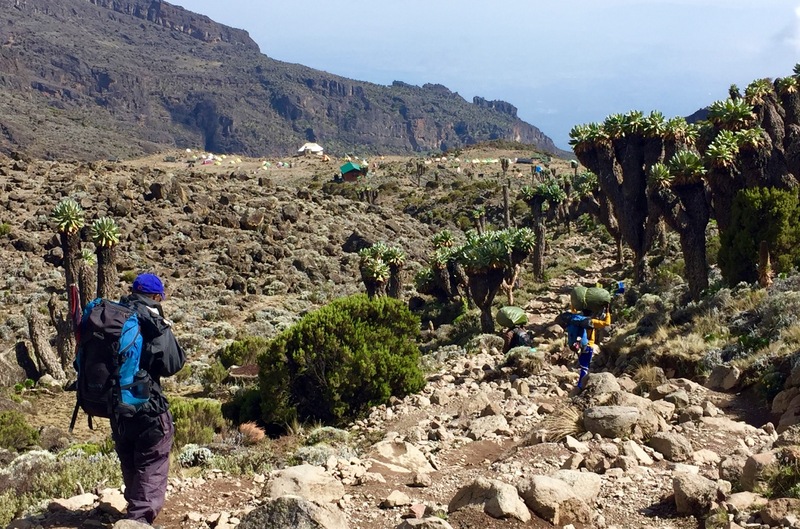 Traversing seemingly endless expanses brought us ever closer to Kibo. At this height, I noticed for the first time that air had gotten considerably thinner. 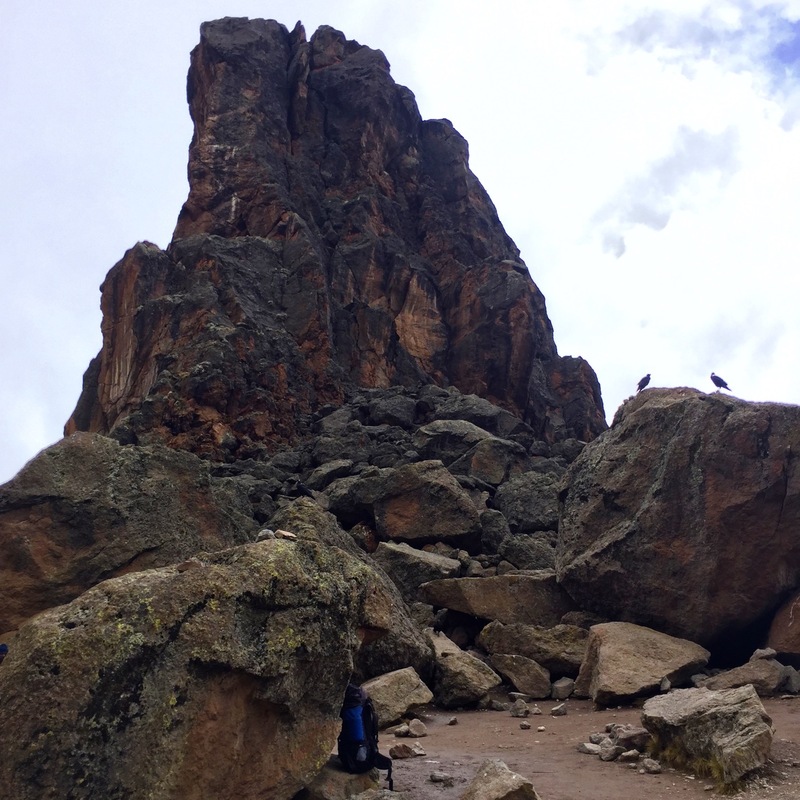 Especially the hike to Lava Tower up to 4,600 meters (around 15,000 ft) seemed like the end of a jogging round at full speed – the only difference being, that we advanced step-by-step! Once we arrived at Lava Tower we had lunch, which gave us new energy. Overall, I ate and drank a lot (even more than usually!) during the time on the mountain; a good sign, as Erasto said, as it means the body is adjusting to the height and thus needs more energy. Hence, my recommendation – take enough snacks such as cookies, muesli bars and dextrose with you. After lunch, we descended from Lava Tower. “Walk high, sleep low” – a good method to adjust to the height. 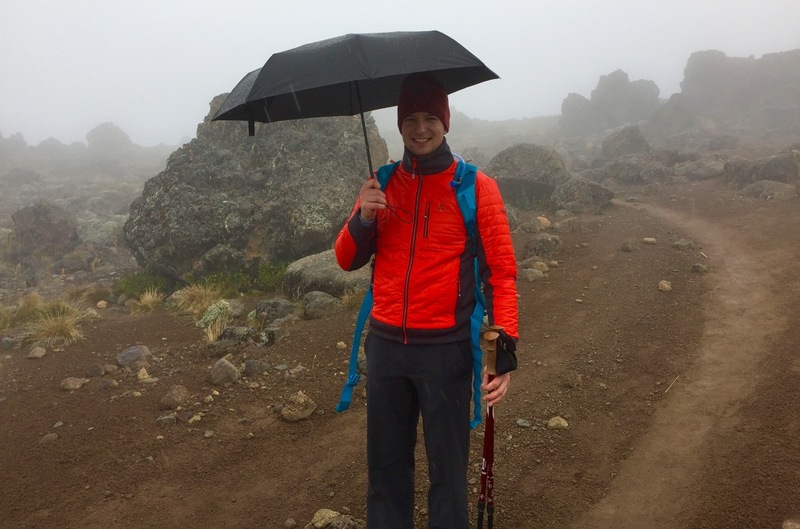 We walked across scree fields and through fog and rain and finally arrived again at the 4,000-meter mark. By then, the sky had cleared up. 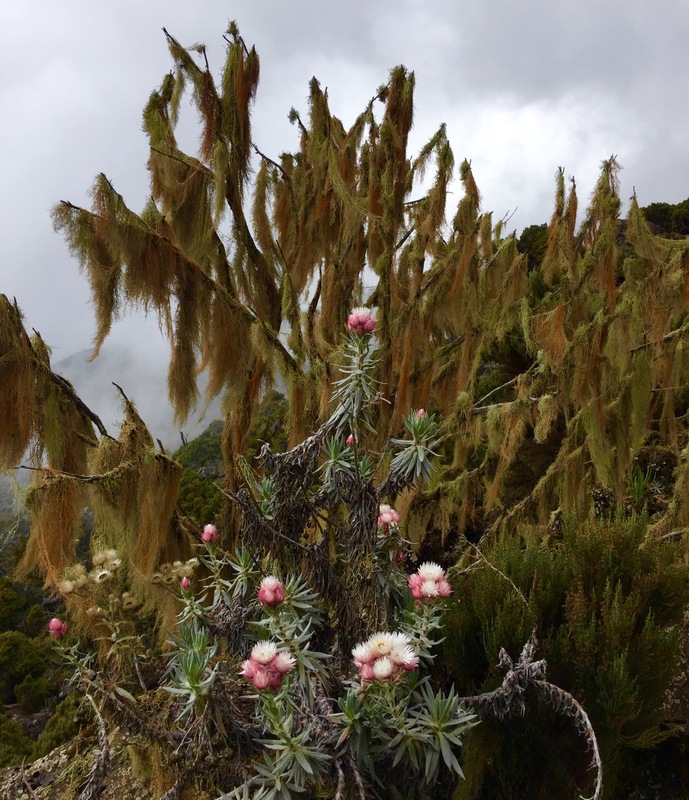 Along the way, there were giant groundsels (Dendrosenecio kilimanjari), a type of plant that can grow hundreds of years old. 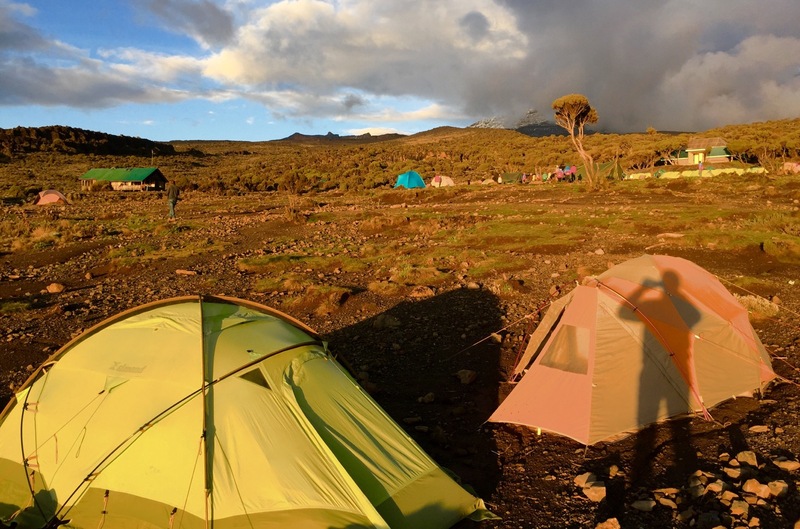 From the distance, we could already see 3,900 meters high Baranco Camp, where we arrived in the early afternoon. 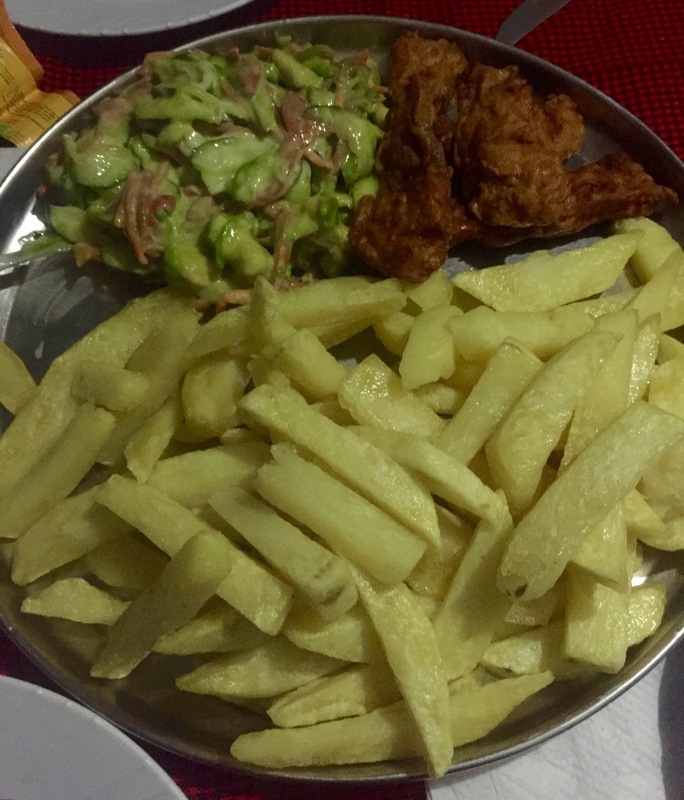 This stage should rather be referred to as: Baranco Camp to Baranco Wall to Karanga Camp…! After a few hundred meters of gentle walk, the path leads steeply uphill. The so-called Baranco Wall is nearly 300 meters high and leads up to more than 4,200 meters. We had a magnificent view from up there, and also reached the highest point for the day. From there on the path to the next camp continues relatively steadily straightforward with only minor ascents and descents. 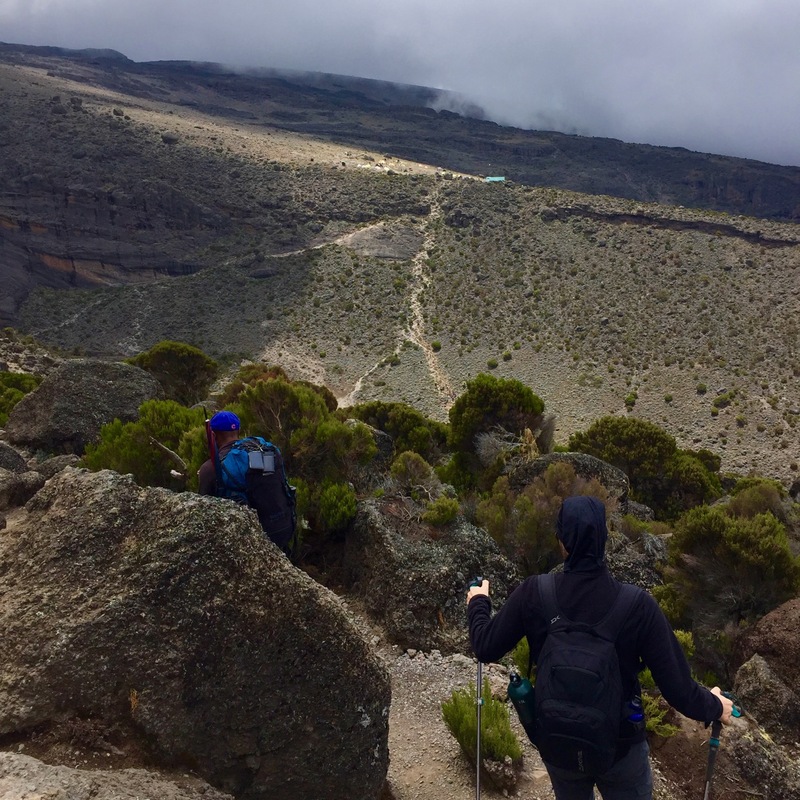 Only the last couple of meters challenged our motivation once more: Around 500 meters air-line distance ahead of us we could already see Karanga Camp. To get there, however, we first had to descend approximately 200 meters altitude to the valley, to then reclimb the same 200 meters altitude again. Wonderful. Once arrived at the camp, we had enough time to relax. 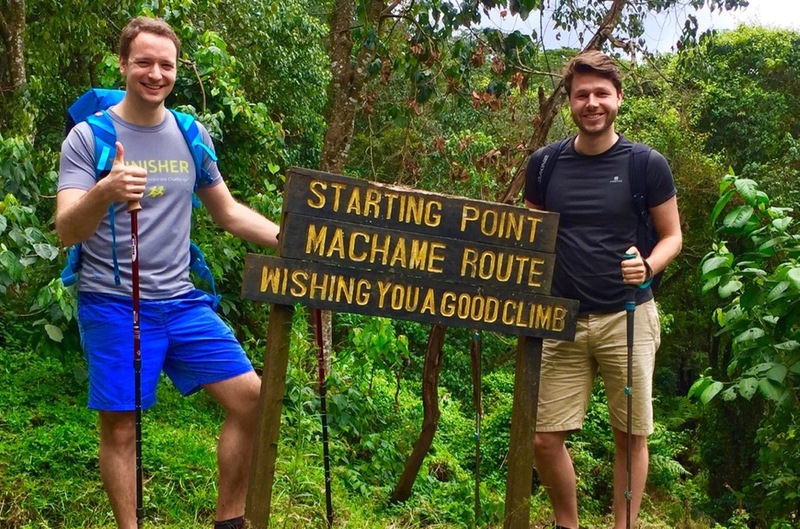 Timo and I opted for the 7-day tour – the longer of the two tours if you ascend via Machame Route. 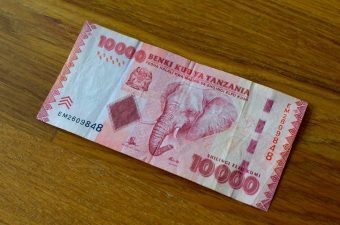 Therefore, we had an additional night in Karanga Camp. Tourists that opt for the 6-day tour only make a short stop there. 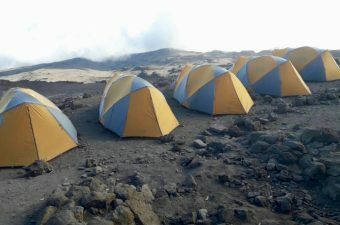 They then continue the same day to the base camp. 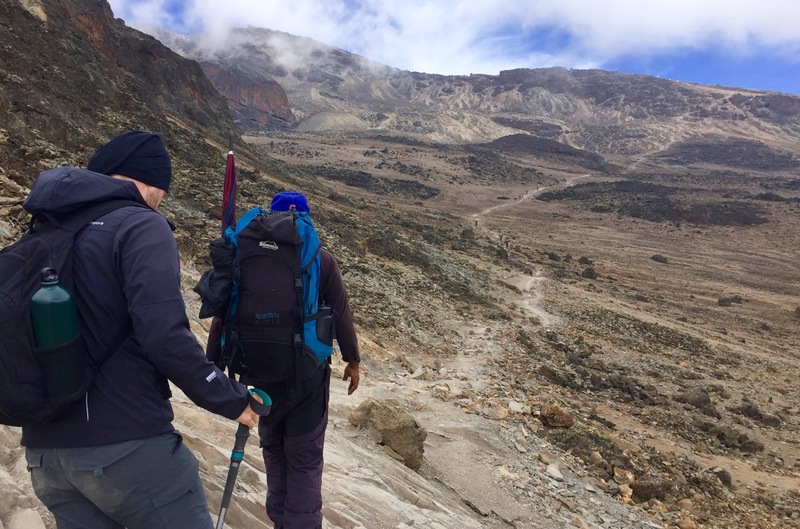 One of the best things you can do to acclimatize to the height is to ascend slowly. 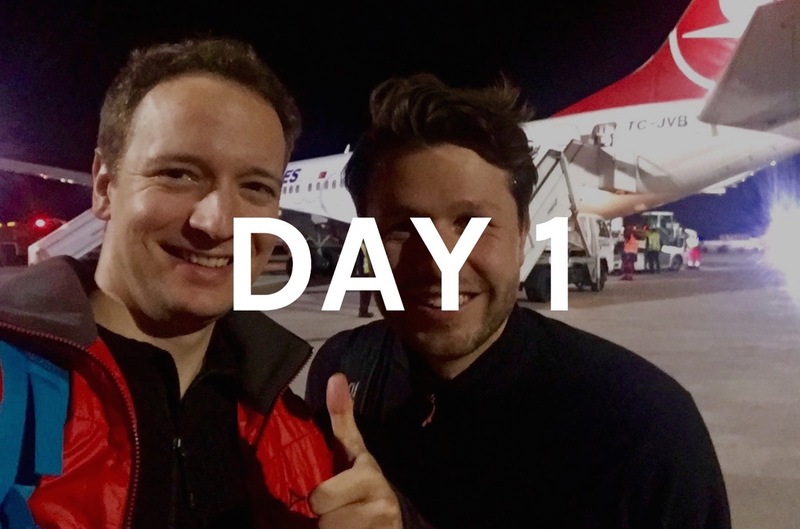 Therefore, Timo and I decided to take the longer route, which I recommend to anyone. 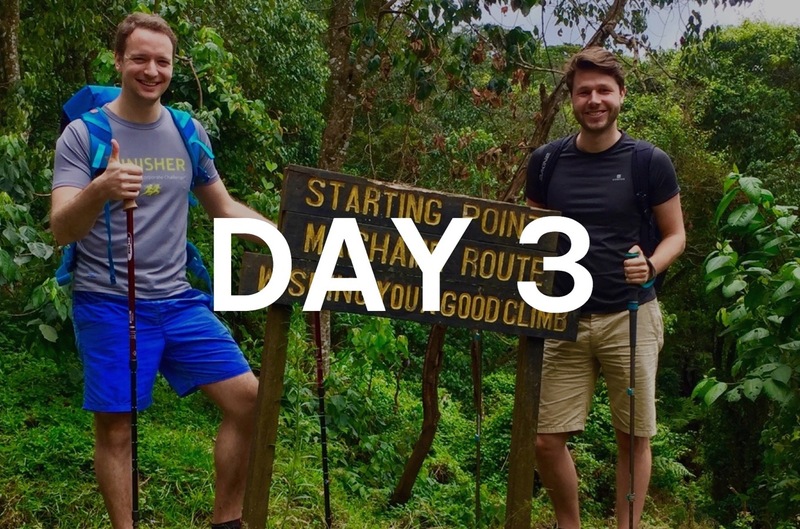 The final stage to the base camp was relatively short, just as the one the previous day. Both days we only walked 3-4 hours each day. 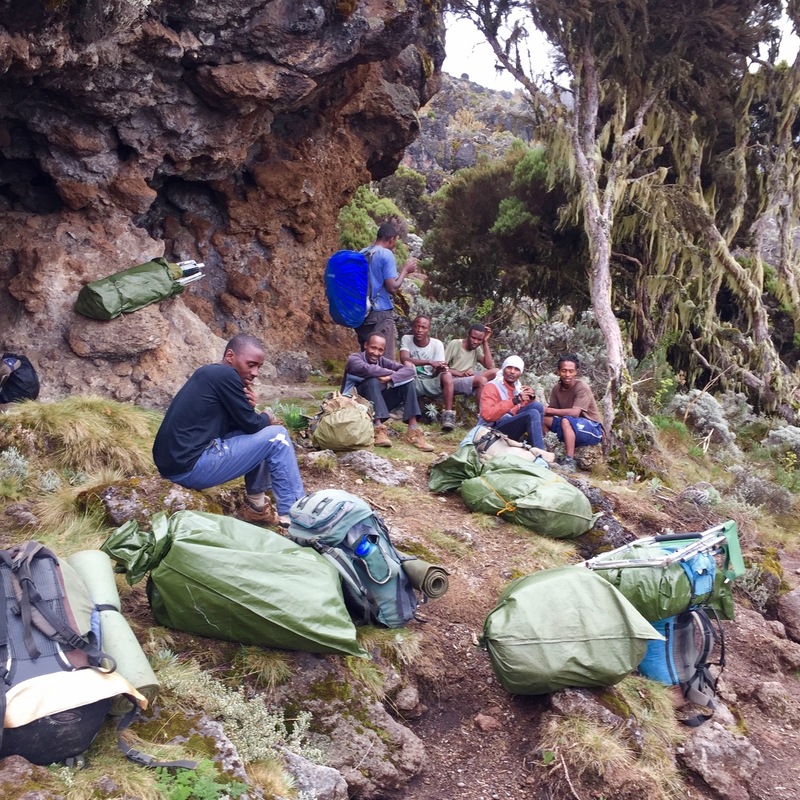 Consequently, we had sufficient time to rest and discuss the upcoming summit climb. The trip by itself was already a great experience. 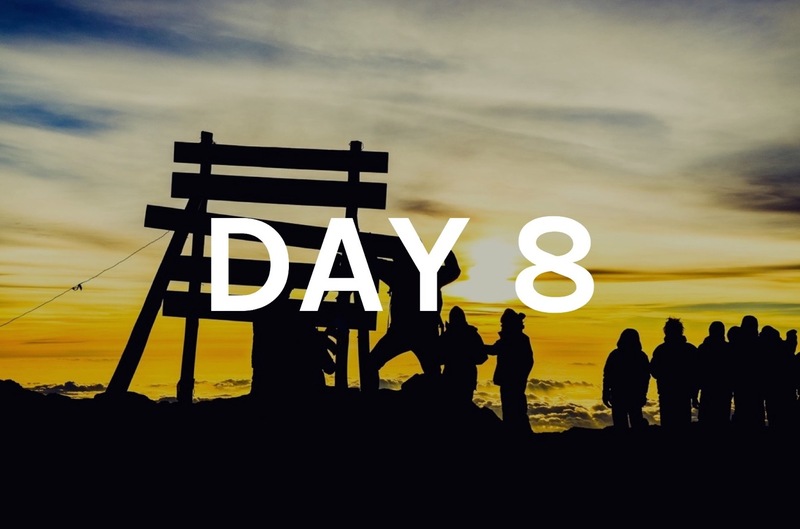 Our goal, however, was to reach Uhuru Peak, the highest point of Mount Kilimanjaro at 5,895 meters (19,341 ft). 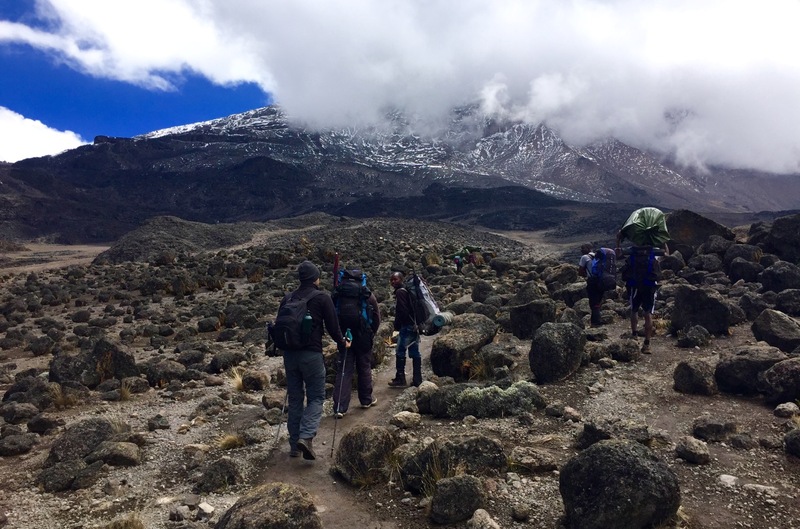 The trail between Karanga and Barafu Camp is similar to the one from the previous day. 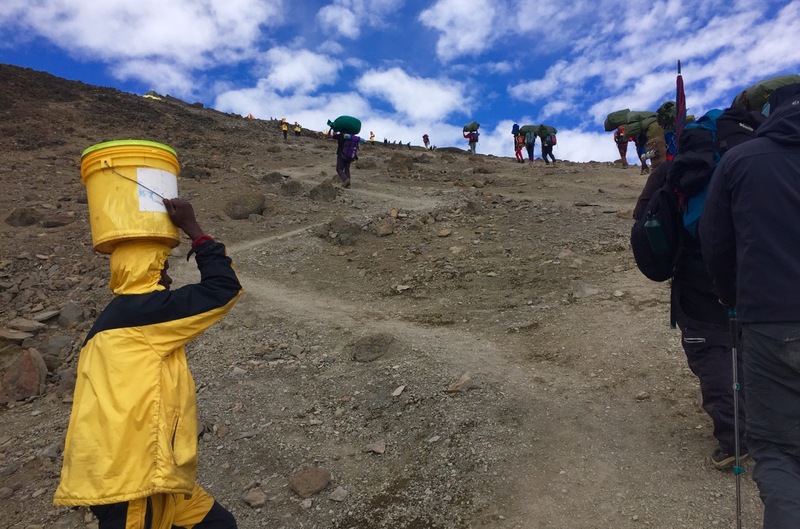 We walked across vast scree fields and on narrow paths along the slopes of Kibo. We pretty much walked around the mountain, mostly uphill. 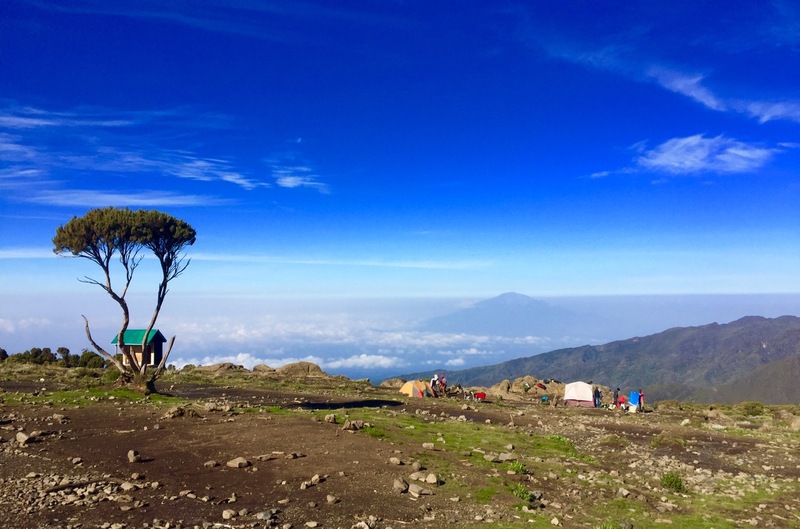 Consequently, the 700 meters altitude difference did not pose a big challenge. Only the last few hundred meters, the way goes steeply uphill. 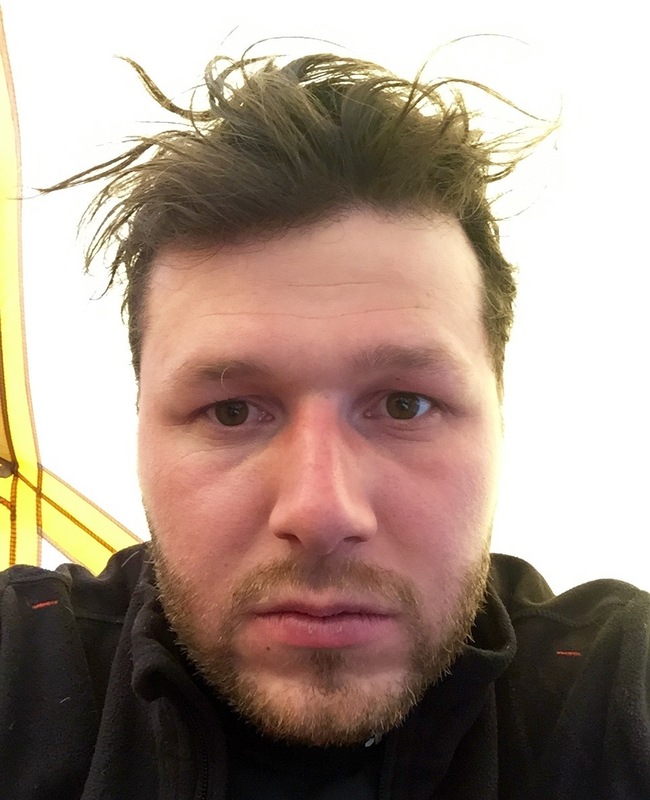 Timo’s energy levels had dropped, and therefore he went straight to our tent to relax. Our group picture for the day hence only shows me. Was that a sign for altitude sickness? 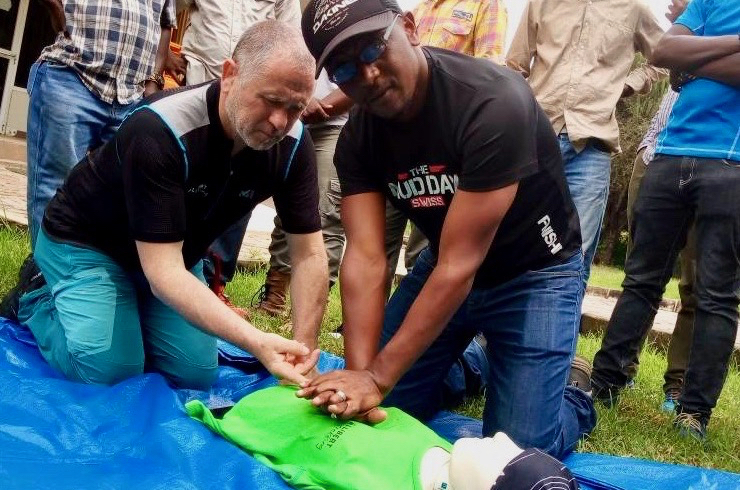 Was the summit climb at stake?